"I know first-hand that delivering high-quality, local journalism has never been more important," Knight wrote in his memo announcing the departures. "I am committed to continuing to find the business models that fund our journalism." 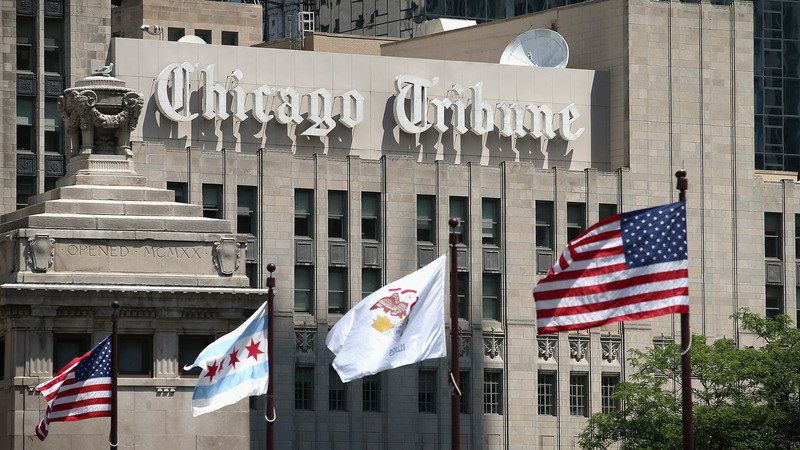 Like many peers, Tribune newspapers have struggled to find a winning formula and have undergone repeated cuts under current ownership. The recent history of Tribune Publishing involves a series of incidents in which executives stood accused of enriching themselves at the expense of their journalists. Justin Dearborn had joined Tribune Publishing as CEO in February 2016 at the behest of his longtime business associate Michael Ferro, who took a controlling minority stake in the company just a few weeks before. Dearborn became chairman early last year after Ferro stepped away from a formal role in light of accusations of sexual harassment levied against him by two women in Fortune magazine. Dearborn's departure takes effect immediately. Also gone is Ross Levinsohn, a former Tribune Publishing consultant turned executive. In August 2017 he became publisher and CEO of what was then the company's largest and most important property: the Los Angeles Times. In February 2018, Ferro decided that Tribune would sell the LA Times to one of the company's other major stakeholders, Dr. Patrick Soon-Shiong, a multibillionaire. (Tribune also sold The San Diego Union-Tribune to Soon-Shiong.) The resurgent and newly independent LA Times has gone on a hiring spree. As part of that sale, the company announced Levinsohn had been cleared of any concerns of misconduct and made CEO of Tribune's digital publishing division. Levinsohn's deputy there, Mickie Rosen, had worked with him at several earlier ventures. She too is leaving the company. Last month, NPR reported that Tribune Publishing had struck a confidential deal to pay $2.5 million to Levinsohn's predecessor as publisher of the LA Times to forestall a wrongful termination lawsuit. The lawsuit would have publicly disclosed anti-Semitic remarks by Ferro that he made at a dinner with company executives. They were recounted to NPR by two people who say they were in attendance that night and heard them. The company became known within the industry for its highly generous compensation for its executives, particularly Ferro (formerly chairman), Dearborn and Levinsohn. The latter two were to receive significant compensation in the high seven figures if the company was sold by the end of 2018. And Tribune had sought bids last year, attracting offers from the McClatchy newspaper chain, among others. Ferro and Tribune had sharply rebuffed earlier approaches by the Gannett Co.
Now, news reports suggest Tribune Publishing has sought to rekindle interest from Gannett — itself the target of a hostile takeover bid by a newspaper company controlled by a hedge fund known for slashing its newspaper properties. Tribune remains very much on the block. Knight was Tribune Publishing's president and had helped lead the parent company to the Chicago Sun-Times when Ferro was the controlling owner of that tabloid. Former U.S. Rep. David Dreier, a Republican from California, is the new chairman of the board.